10 % Off all Cables Use code 6000 at the Checkout! 90° upward angled connector enables easy installation -- even in the tightest spots! Premium Shielded SXGA Cables with angled connectors give you maximum flexibility for positioning your monitor. The 90° connector on one end of the cable allows installation in even the tightest of locations. 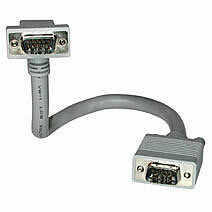 These premium VGA cables are ideal for video presentation devices, video splitters, and KVM switches. Constructed from premium grade video cable, these cables use a combination of coax and twisted pair to accommodate cable runs up to 100 feet away, without the typical distortion problems associated with extended length cabling runs.